Welcome to the Parish of All Saints South Hobart, within the Diocese of Tasmania! The Parish was established in 1858 from the Parish of Battery Point. The members of our community come from many parts of greater Hobart. Each person enriches our community life as they bring their individual stories; share their spiritual journey, their differing gifts and hopes, their joys and sorrows. These are among the gifts we bring into every Eucharist, offer them to God and draw strength to continue our journey as we feed on the body and blood of our Lord Jesus Christ, truly present with us in this most holy sacrament. We offer a warm welcome to all who enter our doors. The Church is open daily from 8.30am to 5.30pm. Many people bless us by their presence each day as they sit, pray, meditate, light a candle. We seek to provide a variety of worship experiences for all who wish to share in our community life and we rejoice in the breadth of Anglican experience represented in our “catholic” community. Our parish worship continues the tradition of Anglican worship in the Catholic Tradition through ‘A Prayer Book for Australia’. We offer each Eucharist to the glory of God and in thanksgiving for death and resurrection of our Lord Jesus Christ. We seek to be united with the whole church living and departed in the Lord Jesus. The Eucharistic vestments are worn. On Sundays the 7.45am Eucharist is said and without music, usually in the Lady Chapel; while the 10.15am is a Solemn Eucharist with the ceremonial of the Catholic tradition of Anglicanism, including incense. The Choir sings at the Solemn Eucharist on the fourth Sunday of the month and on some feast days. The evening services at All Saints include Evening Prayer with Eucharistic Devotions, Solemn Evensong and Taizé Prayer. Full details of all our worship can be found on the Liturgy page. Saint Raphael’s Church, Fern Tree, is situated at the foot of the beautiful Mount Wellington. The Eucharist with hymns is offered there each Sunday at 8.45am. 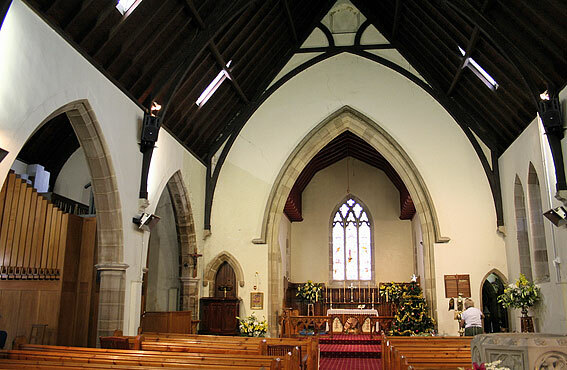 The Parish is blest by having two such beautiful Churches and two worship styles that complement each other so harmoniously and reflect the rich diversity of the Anglican tradition. We give thanks to God for those whose faith and life have brought us to this place and time. We also give thanks to God for his call to each one of us to carry the light of faith forward.